Advanced laparoscopic surgery requires good eye hand co ordination and familiarity with surgical anatomy. Learning curve for various complex laparoscopic procedures is steep. The major colorectal and Oesophago Gastric cases are particularly challenging. There are few realistic models which allow the surgeons to accomplish competence in the knowledge of anatomy and depth percetion and tactile feed back just before embarking upon thier first case on the patients. In United Kingdom live animal models can not be used by law for training purposes. These models while appropriate for some laparoscopic training exercises are still limited in anatomical similarities to the human body. In Maidstone/Bristol, United Kingdom we have set up advanced courses in Laparoscopic and Thoracoscopic cadaveric surgery. These courses are aimed at consultant surgeons and senior trainees. We formally assess their satisfaction with the Cadaveric model and its application in their surgical practice. Soft fix Cadaveric models were prepared to allow Laparoscopic/ Thoracoscopc surgery. 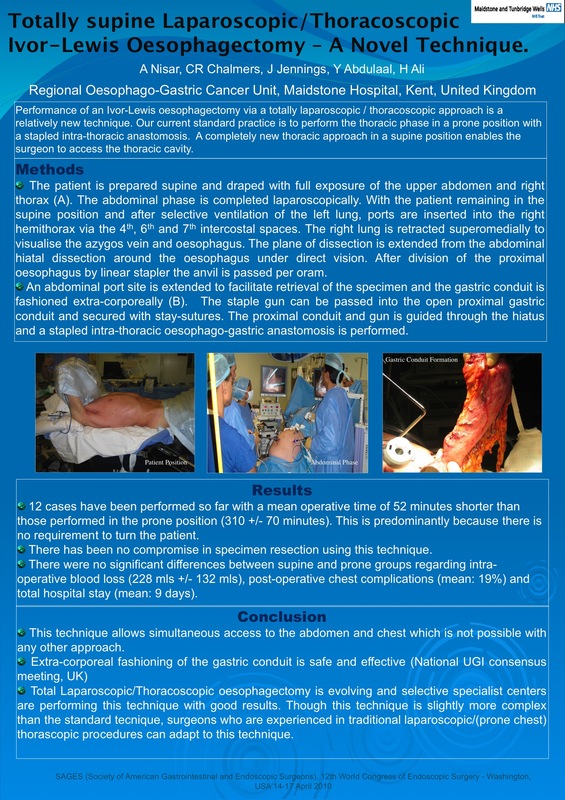 Special frames and other preperation was done to make it feasible to perform Minimal invasive surgery in Oesophago Gastric and colorectal disciplines. These courses run over two days and High definition equipment is used for surgical dissection preceded by video presentations of the operations highlighting the technique, technical challenges and solutions. Colorectal surgical procedures include Right hemicolectomy, Mobilisation of Splenic flexure and left hemicolectomy. Sigmoid colectomy and anterior resections. Oesophago gastric surgery programme includes Gastric mobilisation, hiatal dissection, splenectomy. Thoracoscopic dissection included oesophageal mobilisation and familiarisation with the thoracic anatomy. Participants are encouraged to to assess the area of dissection with open method and also advised to refresh their knowledge of anatomy in the other areas of interest. Four courses have run successfully over a period of two years (2008-2009). 84 surgeons have attended these courses (14-24 pr course). Participant to faculty ratio was 2:1. Overall satisfaction was 96% (84% rating this as an excellent course). 74% of the participants believed that the course will grately improve their surgical skills. 21% of the surgeons expected some change in their surgical skills. 89% of the surgeons considered Cadavers to be good model for familiarisation with relevant anatomy and eye hand co ordination improvement. 23% of the surgeons commented on the tissue feed back and felt that tissue handling was not the same as real patient surgery. Over all the feed back was positive and the surgeons felt more confident to perform surgery for certain procedures after the course. Laparoscopic Thoracoscopic Cadaveric model is useful for training the surgeons. This could be missing link between theoretical and some practical hand on courses and real surgery. This course allows the surgeons to familiriase with the human anatomy and also allows them to practice certain skills and develop good eye hand co ordination and depth perception. We believe that the surgeons in various specialities should be trained on Cadaveric model before embarking upon major laparoscopic surgical cases.